/ Modified may 25, 2018 2:27 p.m.
A rendering of development under construction, called The Village, at the UA Tech Park near Rita Road and I-10. 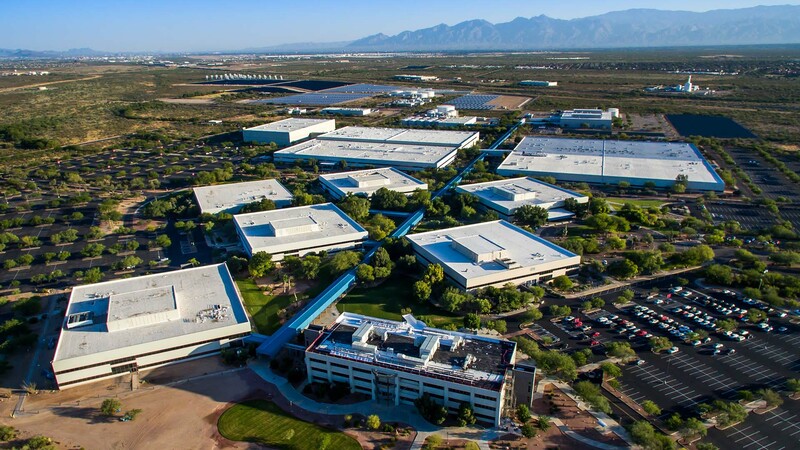 Inside Tucson's tech quarters, the University of Arizona has hired two developers to assist in a master plan that includes expanding and developing two tech parks in the Tucson area. Tech Parks Arizona comprises 70 companies, and Bruce Wright, associate vice president for Tech Parks Arizona, says the more than 30-year-old site off Rita Road and I-10 has a vacancy of nearly 2.5 percent. The University of Arizona has announced Bourn Companies will assist in developing 175 acres west of the site off Rita Road and I-10 for a multitude of uses. "The park wants to be more than just a collection of buildings. It wants to be an innovation community," Wright said. 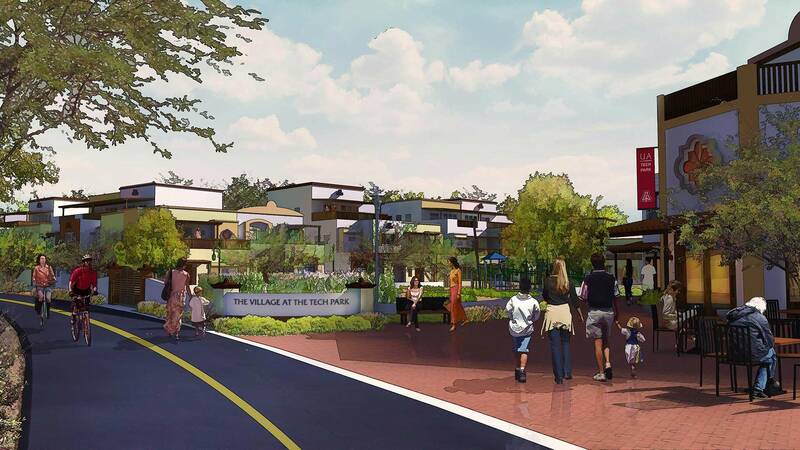 Roughly 50,000 residents live within five miles of the park, and with new elements like offices, retailers, residential and hotel uses, Wright says it will provide an urban concept called "The Village." The new developer plans to help in doubling the size of the tech park. Wright says that could add anywhere from 10,000-12,000 additional employees, if the economy continues on its current path. He also says it will benefit current employees, especially the millennial cohort, who have expressed a long-time interest in living closer to the Tech Park at The Village. It's estimated that by 2030, 60 percent of all workers in that workplace will be millennials, Wright said. VIEW LARGER An aerial view of UA Tech Parks off Rita Road and I-10. An area west of the site is planned for residential, retail and office development. "Making this site much more attractive for millennial employees makes it more attractive for technology companies and therefore the success off the park moves forward," Wright said. Since it isn't in the Davis-Monthan flight path, the 175 acres avoids any development restrictions. The expansion of the site could account for nearly 2-4 million square feet of real estate, resulting in a potential $400 million construction impact added to the Tucson economy, according to Don Bourn with Bourn Companies. That represents only a small portion of the overall economic impact from the project, Wright said. "Each year the tech park brings about $2 billion dollars to the regional economy," he said. Final development agreements are being worked out, but construction could start for the overall master plan over the next year. With more than a handful of projects going on around Tucson, many have been delayed because of a shortage of employees in the labor force. Wright hopes the market will catch up. "Eventually the market will catch up with it, and market demand will generate those jobs, but we have concerns about that," Wright said. He sees the 1,300 homes being developed in La Estancia across from Kolb Road benefiting from the resources The Village will bring to the surrounding community. A concept illustration of the new precincts at the UA Tech Parks at The Bridges. 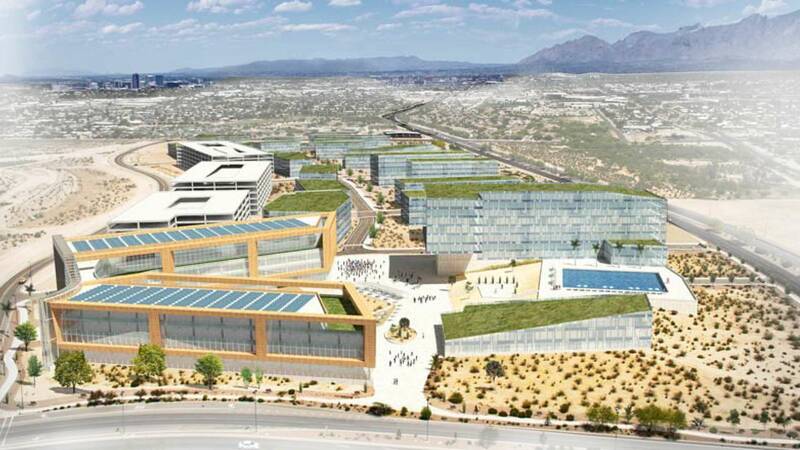 A project that has been more than a decade in the making at Kino Parkway and 36th Street, known as the the UA Tech Park at The Bridges, is finally gaining traction since being held back by the 2008 recession. Through a land trade, The Bridges was able to acquire 65 acres of land. A national request for proposal (RFP) led to the Boyer Company out of Salt Lake City. It will be in charge of developing a corporate, university, business and technology precinct that will make up the Tech Park at The Bridges. Boyer Company previously partnered with the University of Arizona when it collaborated in developing their biomedical campus in Phoenix. Once the planning agreement is finalized, the first two buildings planned for construction are known as the Innovation Technology Complex. It will be in the technology precinct on the south-west corner of Kino Parkway and 36th Street. One building at 120,000 square feet and four floors high will serve as an education environment with additional office spaces. The second building is larger and will incorporate labs, technology research with additional office space available. It is 180,000 square feet in size and six stories high. The University of Arizona has interest in occupying some of the office space by relocating Tech Launch Arizona, the central offices for Tech Parks Arizona as well as other smaller technology companies. Across from the two buildings sits a potential 300-unit hotel that Wright calls one of Tucson's first full-business hotels. Other plans include incorporating city transportation into The Bridges area. "We would really like to see the second leg of the modern streetcar come down the Kino-Campbell corridor. There is also talk about bringing the Old Pueblo Trolley," Wright said. He also included the CatTran, which is used for transporting University students around campuses. A total of 112 acres of land adjacent to the precinct developments of the tech park is in the process of being purchased by Bourn Companies. That is where construction of the three-story Geico building is planned, according to Don Bourn with Bourn Companies. To the west of the Geico property, Bourn plans to add a county park. Bourn's plans also include turning the corner of Park and 36th Street into a 300-unit urban residential village. "The idea is to have single family and multi-family housing of various price points for sale and for rent," Bourne said. Through the entire process Wright says the UA Tech Park at The Bridges will serve and incorporate the entire community. "We are working really close with them to strike that balance so that we help them with jobs and improvements of the neighborhood," Wright said. "But at the same time it doesn't get gentrified to where we pushed them out the door." If all goes as planned, construction is expected to begin in the next year.